Meanwhile last week, Iowa Republican Sen. Charles Grassley announced that the government has estimated Mylan may have overcharged Medicaid by as much as $1.27 billion for the EpiPen under the agency's drug rebate program. Should we be free, as individuals, to make and take our own medicine at home? Who’s responsible if we get hurt or die? Do we have to right to do what we wish with our bodies in the interests of survival, healing and self-care? For years, such questions have been at the heart of public health debates over euthanasia – the right to die – and even drug addiction. They also lie at the center of the infamous Mylan EpiPen pricing scandal. Last fall, Mylan CEO Heather Bresch appeared before the House Oversight Committee to explain the company’s 548 percent price hike for a simple device that injects a lifesaving anti-allergy hormone, FDA-approved epinephrine. The cost drove desperate allergy patients to seek alternatives, including the dangerous practice of shooting epinephrine straight from a vial into a muscle. 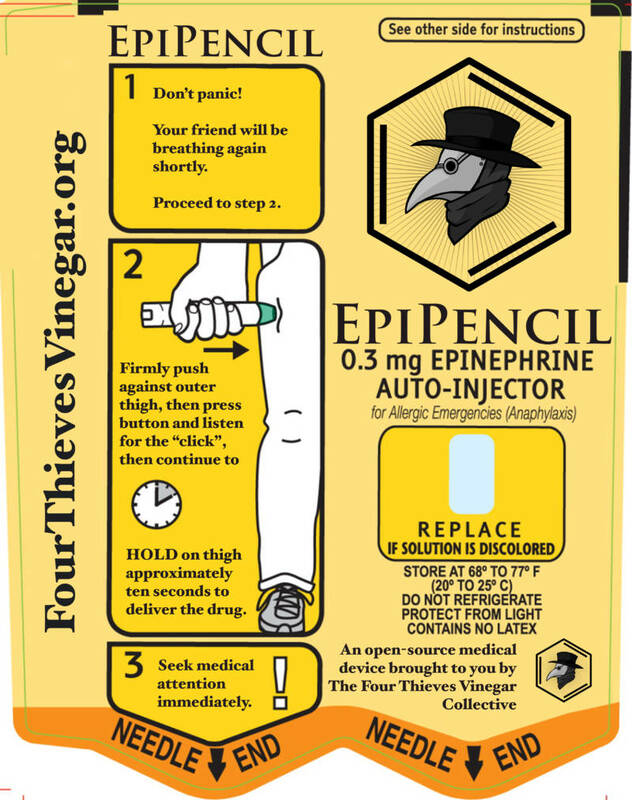 Enter a new challenger: the pharmaceutical hacking collective Four Thieves Vinegar. 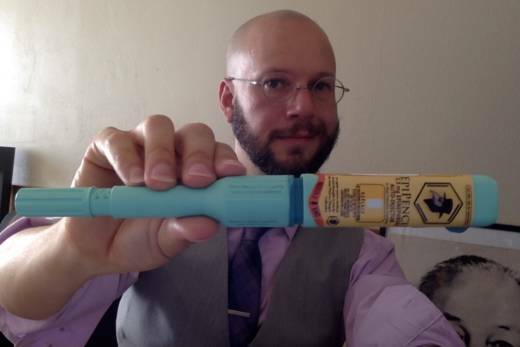 The group is led by Michael Laufer, a math professor by day at Menlo College in Atherton, California, who shot to internet fame overnight last August when he uploaded a DIY instructional video that went viral, showcasing his homemade version of a copycat EpiPen he called the EpiPencil. His device costs around $35 to construct– a fraction of Mylan’s $600 brand name dual-pack EpiPen. Anyone can make it at home for personal use, he claims. Laufer isn’t a medical doctor and doesn’t pretend to be. But he’s a numbers guy, well versed in computer science, and has dipped into biology and chemistry. It took him two weeks to research and assemble the plastic components of the EpiPen, an auto injector created by a NASA researcher and marketed in 1980 for $20. Mylan later picked up the patent and has benefited from a monopoly. Four Thieves Vinegar is named after a folk remedy made from vinegar and spices to ward off bubonic plague. The collective is part of the fast-growing DIY Biology movement, a subculture in which tech meets pharma--a Maker Faire for bio-geeks. 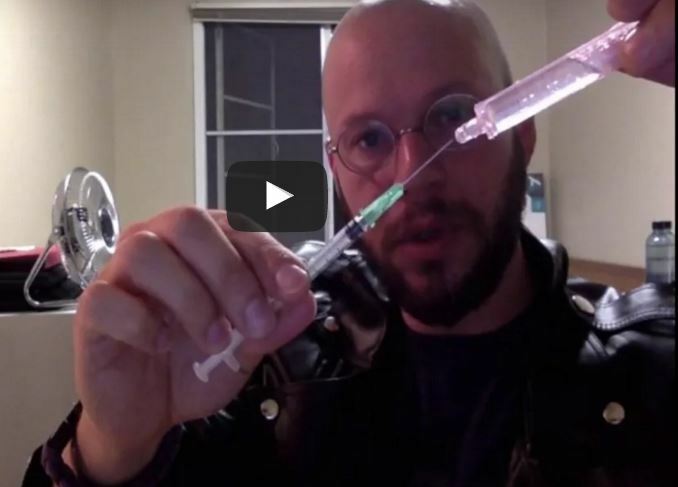 In the video, Laufer carefully demonstrates how anyone can do what he did: combine a cheap off-the-shelf needle injector made for diabetics that is easy to buy on the internet, and combine it with a syringe that can be preloaded with a $1 dose of epinephrine. Under fire, Mylan soon released a $300 generic of its EpiPen, but that did little to quiet critics. Georgia Congressman Buddy Carter accused the company of failing to disclose the truth about its profiteering. “There is no transparency, that's the problem here," he declared. Leaders also criticized the FDA for its slow-paced approval of generic rivals. Teva Pharmaceutical Industries failed to get approval for its generic EpiPen in late 2016, but expects approval by 2018. Meanwhile, CVS Pharmacy has just released a $109.99 generic two-pack EpiPen called Adrenaclick. At $55 a pen, it’s close to Laufer’s DIY price -- and provides consumers with a safe, FDA-approved product. That’s exactly what Laufer hoped might happen. As he sees it, his EpiPencil hack was a classic example of The Emperor Has No Clothes: It revealed the actual cost of the plastic auto injector – and showed others how they could make such a device cheaply. It’s a mixed victory, though. The media spotlight gained supporters for Laufer's collective, but also opened him up to criticism. “I get a lot more fan mail then hate mail,” he says, including from parents. But others sharply condemn his actions, and his hacking group’s broader mission: making medicine at home. Contamination and improper dosing can happen with approved drugs too. Epinephrine is a serious drug, used to shock the heart. Laufer defends his device as safe. “In most ways it is equivalent” to Mylan’s EpiPen, he argues, pointing out that it features a safety cap like approved EpiPens, and only carries a single dose. But it’s still untested. And as the father of toxicology himself, Paracelsus, famously warned: all medicine is poison at a certain dose. Oncologist Ezekiel Emanuel, a bioethicist and senior fellow at the Center for American Progress, adds to the chorus of concern, cautioning strongly against using the device. He said the solution to high pharmaceutical prices was "not this cockamamie 'let people throw drugs out there untested,'" but to reduce the market power that drug companies rely on to set prices. "We give drug companies monopolies through the patent law, and marketing exclusivity," he said. "No other country gives a monopoly and then expects good behavior on pricing. "So what we’ve done is say, 'Oh we’re giving drug companies monopoly pricing power and then we’re like shocked, shocked they're raising prices." Margaret McLean, director of bioethics at the Markkula Center for Applied Ethics in Santa Clara, also agrees using Laufer's device could be dangerous. She herself, carries an EpiPen. It carries a higher copay than her other medicines, so she sympathizes with parents who can’t afford even generic versions. But the safety risks remain serious. Perhaps surprisingly, Laufer agrees about the warnings on safety. “Chemistry is science. So, yes, it’s a concern. You have to think immediately, ‘What if it’s misused?’ But that’s a first-order reaction,” he says. “Ideologically, I believe that more access to more information is inherently better for everyone.” He supports FDA safety reviews and clinical trial tests for new drugs and devices that are marketed to consumers. But he stresses, he’s not marketing anything. In his cramped faculty office, Laufer greets visitors with a warm smile, eager to share his mission and rebut critics who, he feels, have misperceptions about the true goals and the impact of his hacking action. Online, he looks like a steampunk rebel hero in a metal-studded leather jacket, rimless glasses shoved high on his forehead. Offline, he’s natty in a dark suit, purple tie and tie pin, and fancy abacus-shaped cuff links befitting a math geek. “I believe in empowering people, in sharing information,” Laufer says, citing his hacker creed. “We need to talk about alternatives to expensive medication regimens.” He compares the need for a cheap drug delivery device like his EpiPencil to IKEA furniture: something that should be easy to make, with simple instructions for the average consumer. Anyone who copies a patented device risks running afoul of patent law. It's a form of civil disobedience with life-or-death stakes. That make it easy to justify, according to Laufer's group, whose website asks, "If the choices presented to you are to die, because you cannot afford medication, or violate a copyright, which would you choose?" Four Thieves Vinegar is presently focused on “small batch” chemistry--medicines that are easy to make with at-home equipment. Laufer’s first successful hack was pyrimethamine (brand name Daraprim), a decades-old drug used to treat toxoplasmosis in AIDS, cancer and malaria patients. Turing Pharmaceuticals purchased the patent in August 2015 and, a month later, hiked the price for a single Daraprim pill overnight by 5,000 percent, from $13.50 to $750. Turing CEO Martin Shkreli became a Big Pharma pariah. In response, Laufer made a batch of DIY Daraprim for $2 a pill. So did a group of Australian high school students. Laufer has now set his sights on several drugs he feels urgently merit greater public access, including the abortion drugs RU-486 (Mifepristone) and Misoprostol; Solvadi, a hepatitis C drug; and Glaxo’s HIV prevention pill, GSK-744. He’s keenly aware his choices remain controversial and politically charged.